Charities that deliver meals to the elderly and sick are being hit extra hard by the sky-high cost of gas. Some are being forced to curtail deliveries, leaving would-be recipients hungry -- or worse, reports CBS News correspondent Kelly Wallace. In Baltimore, where Meals on Wheels delivers 3,500 meals every weekday to the elderly, the program's director says he's almost out of options. "I am worried. Who wouldn't be?" asks Tom Grazio, who heads Meals on Wheels of Central Maryland. With his organization's food costs up 16 percent, its gas costs doubling, and no more fat to trim from the staff, Grazio may have to do the unthinkable. "Someday," he told Wallace, "in the not-too-distant future, unless things get better, we'll be telling people they can't eat today. And that's disheartening." Kelly says a recent survey of meals on wheels programs around the country shows 58 percent losing volunteers due to rising gas prices, 38 percent turning away needy clients, and nearly a-third being forced to cut back on the frequency of deliveries. In rural California, according to the president of Meals on Wheels nationwide, cutting back from daily deliveries to one every two weeks proved fatal -- two seniors were found dead. "We have people who are literally dying in their homes waiting for a meal," says Enid Borden, president of the Meals On Wheels Association of America). "That's a crisis." The situation is dire in New York City, too, Wallace points out. Costs of staples for the Meals on Wheels program there have leaped as much as 60 percent. "For the first time in our 25 year history, we are having to ration food," says city Meals on Wheels Executive Director Marcia Stein. "We are having to make tough choices about who gets a meal who does not get a meal, what days somebody might be without food." Also in New York, God's Love We Deliver, which provides nutritious meals to the sick, is changing the way it shops, to counter soaring food costs and ensure no one is turned away. "We just ordered 200 bags of rice," says Karen Pearl, the charity's president and CEO. "Don't ask me where we're gonna store it! But 200 bags of rice -- because we found out that they're going up another five dollars a bag." Back in Baltimore, volunteer Joanne Lang says she'll still make her rounds, no matter how high gas prices climb: "I can't imagine somebody who really needs this food to eat, I can't imagine saying sorry, I don't have the money for gas, I just couldn't do that." For which 93-and-a-half-year-old Ruth Gore is grateful. "Without Meals on Wheels," Gore says, "I couldn't live by myself." 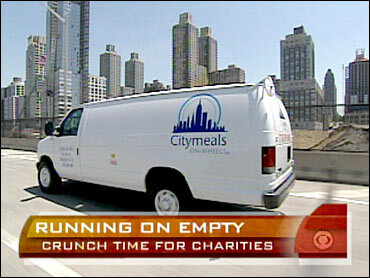 Non-profits are now pushing Congress to give a bigger tax deduction to those who drive their own vehicles for charities. To learn much more about the growing problem, click here and here.